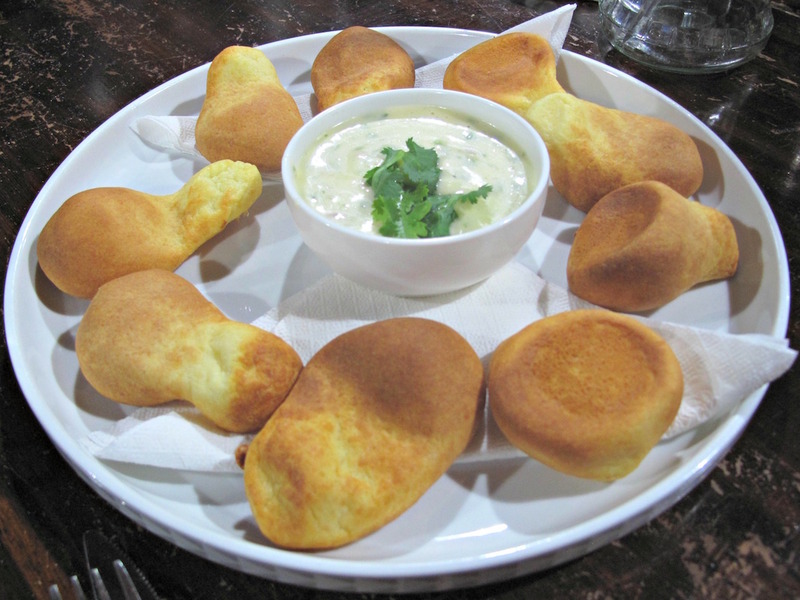 Western suburbs food is ALWAYS exciting for Consider The Sauce. 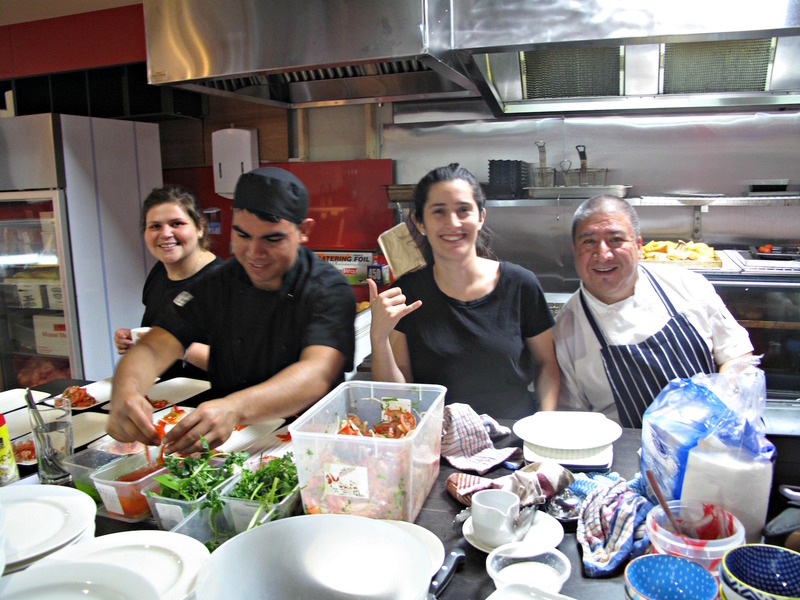 But we reckon there’s nothing that’s been more exciting than the move of Latin Foods & Wines (aka La Morenita) from rather pokey digs in Sunshine to much bigger premises in Deer Park. The business has grown, there’s a definite buzz and the eat-in options have expanded to include not just the empanadas and dynamite sandwiches still available but also proper, plated meals. We’ve tried a number of those latter offerings and are so delighted with the whole new deal we are happy to put an extra 10 minutes drive time to get to Deer Park. 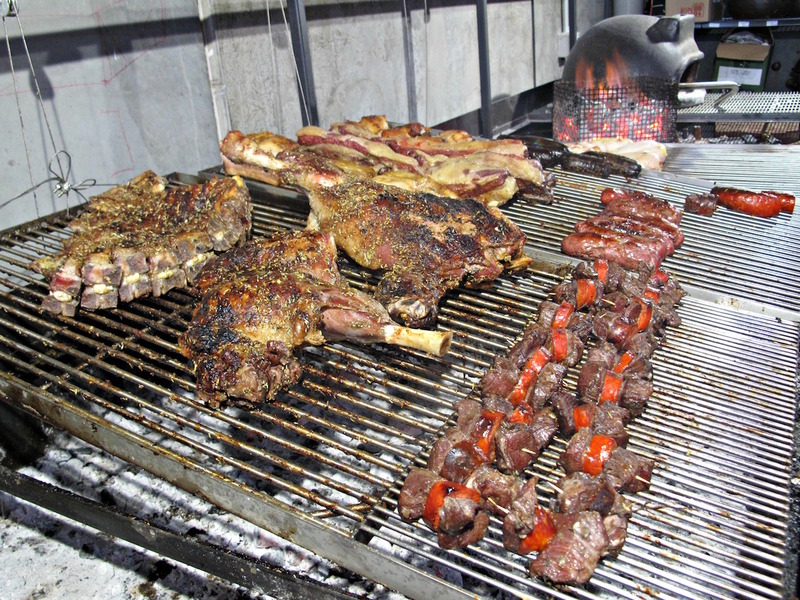 A big part of the expanded business is the parrillada – South American barbecue. It’s been running for a few months – mainly at the weekends. But this Friday night sees its official launch and a test run for Latin Foods & Wines as a regulation restaurant operation. I’ve been only too happy to organise a media/blogger table for the occasion; no “consultancy” fee has been paid – this has been just for the fun of it. We get the same $50 set sample menu on offer to general customers, though in our case the food is complementary. We start with a trio of fine cocktail empanadas with various fillings. I am familiar with the style of the two on the left through multiple eatings at LF&W, but the corn-crusted on one on the right – in the Colombian style, I’m told, and filled with mash ‘n’ meat – makes a nice contrast. Unannounced on the menu are cheesy bread items called pan de bono with mayonesa de ajo. Ceviche – in the Chillean style, I’m told, and made from very finely shredded hake; very lemony. 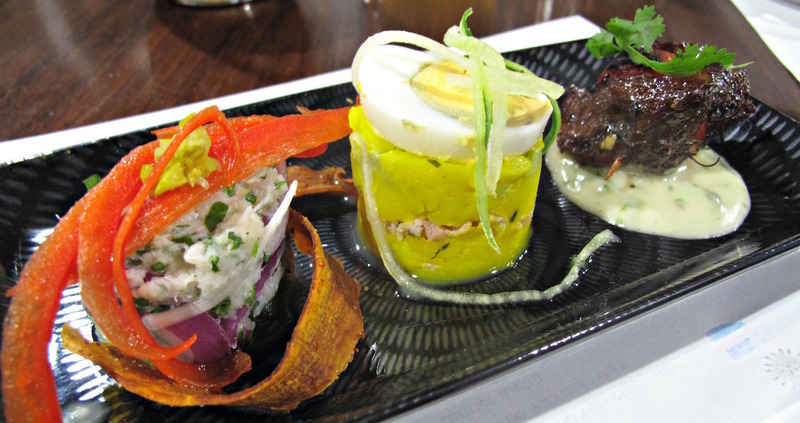 Causa limefia – mashed spud stuffed with chicken and topped with a slice of hardboiled egg. Anticucho – from the barbecue, two beef cubes on a stick, with a slice of chorizo between them. 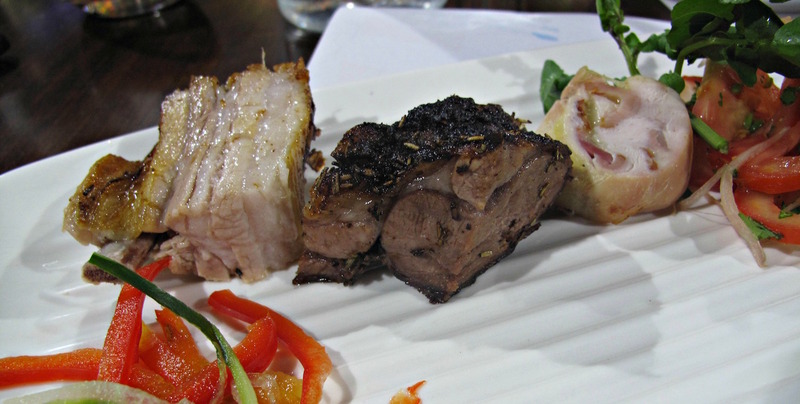 It’s worth noting that South American-style barbecue meats are quite different from the US-style that has become so trendy in Melbourne in recent years. The meat is served mostly unadorned and is, by contrast, well cooked. I had rather feared that we’d be served full-on platters of meats from the regular barbecue line-up – on top of all the other components of our set/sample menu. That’s not the case – instead we get nice sample chunks of costillar (cumin-scented pork), pamplona (rolled chicken stuffed with cheese and ham) and parrillada lamd (scented with rosemary). A good tomato and onion salad accompanies. … which are fabulous and, for several of us, the unexpected highlight of our evening. Tangy pineapple gelato tipped with a wonderful chewy, caramelised cube of fresh pineapple. 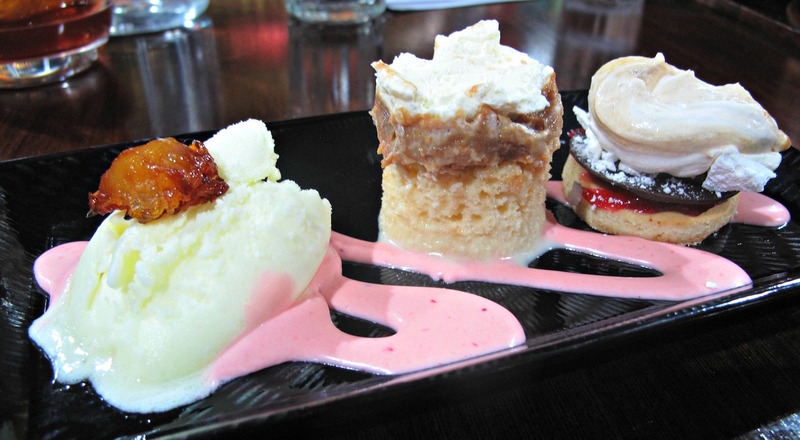 Tres leche – house specialty take on the sponge layer cake popular in various forms throughout South America. Merengue lucuma – a spectacular mix of merengue and chocolate on a biscuit base. The when and how of the various components of the Latin Foods & Wines’ line-up – sandwiches/burgers, more substantial plates, barbecue – is far from settled, so I suggest you phone beforehand to make sure what you’re interested in will be available. I’ve loved not just the food but also the opportunity to rub shoulders – and swap goss – with friends new and old. Among the former have been Cassandra from Hungry Cookie and Maggie from They Call Me Maggie. 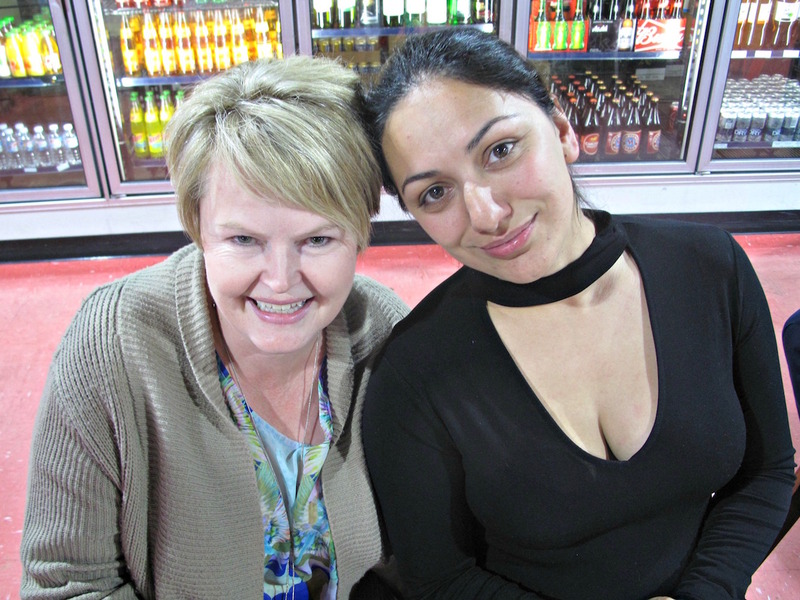 Also on hand have been Susan from the lovely FB page Point Cook Dining and her friend, Saba. The old pals sharing our table have included Jacqui, The Urban Ma, and hubby Wes. 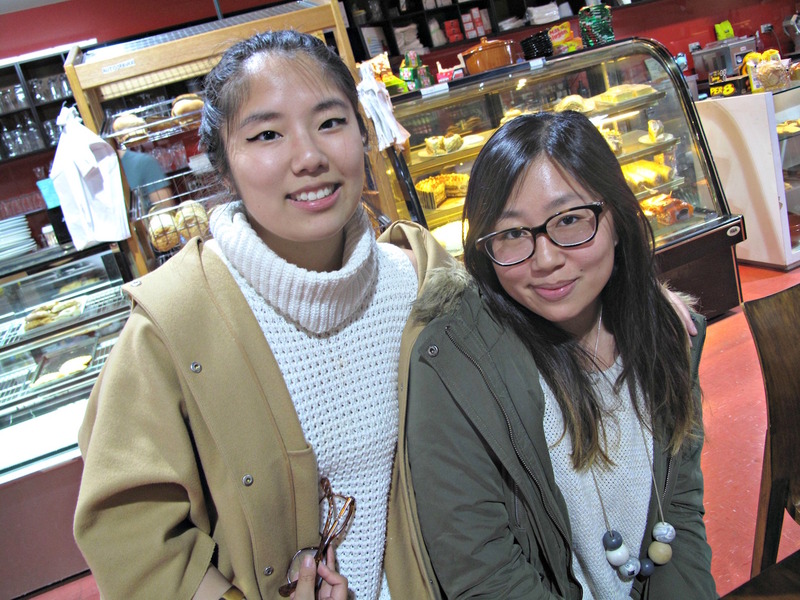 Sorry, Nat Stockley and Jackie – can’t include a pic of you two as I didn’t nail a usable one! 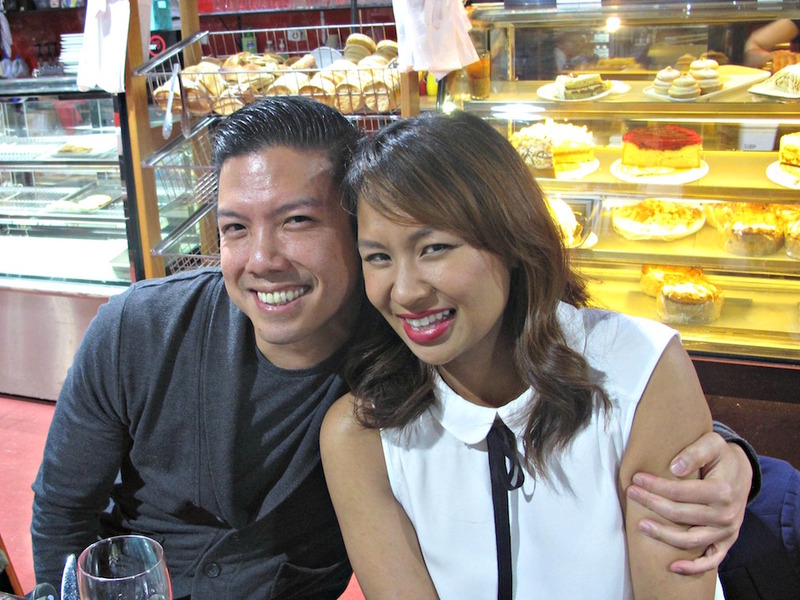 Consider The Sauce and friends dined at Latin Foods & Wines as guests of management. We did not pay for our food.